In 1972 a group of people organized the construction of the impressive Bishop Baraga Shrine. Made of bronze and towering six stories high it is situated on a cliff overlooking beautiful Keweenaw Bay. Bishop Baraga was a great missionary to the Native Americans and the first bishop of the area that is now the Upper Peninsula of Michigan. The Missionaries of the Liturgy purchased the Baraga Shrine Gift and Coffee Shop as well as 14 acres around the Shrine on December 12, 2007. The gift shop has become a Holy Store with a large selection of Catholic books and gifts. The land around the Shrine is being developed as a place of prayer for those who stop to visit the Shrine. Visitors will find a Stations of the Cross path as well as a little chapel overlooking the bay. Plans for the summer of 2009 include making a Rosary prayer path. 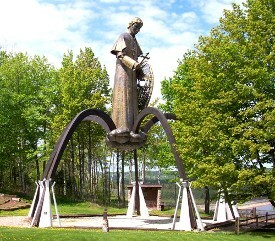 The Bishop Baraga Shrine is located in L’Anse, Michigan (See Map). The Baraga Holy Store is large enough to accommodate retreats.